There is absolutely nothing wrong with enjoying art adherent exclusively to particular mediums, schools, genres or techniques, carefully contained within boundaries of definition, but there is something uniquely profound, and dare I say, magical, about art that spill beyond and unites different styles into one coherent package. Imran Mir’s paintings and sculptural works combine the aesthetics of design with the ambiguity of art to create something that transcends both, and manages to move the viewer on both sensory and emotive levels. 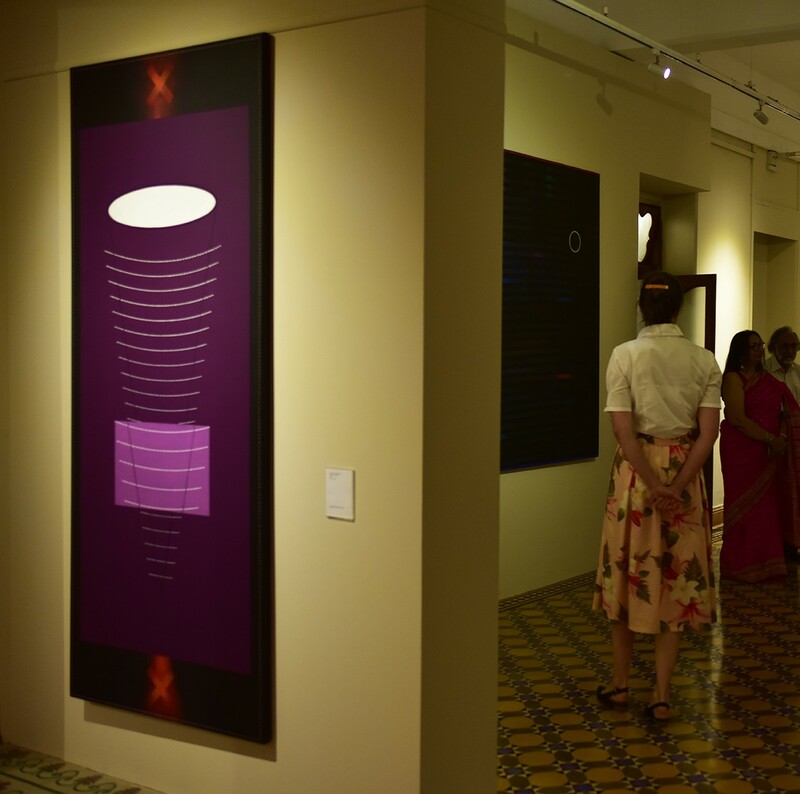 His recent retrospective of sorts at the Mohatta Palace Museum doesn’t just simply bring together a vast collection of the late artist’s works, but presents it in a way that brings the artists subtle trajectories to the fore, making it as much an investigation and analysis as it is a visual treat. Mir’s work holds an affinity to abstract expressionism, seen in his fields of flat, vibrant color and a combination of geometric and organic shapes applied with a perfection akin to print. His dualistic creativity led to a career in both communication design and fine art, allowing a unique sensibility to his work. His sole focus was on exploring lines, shapes, and form, with added spatial concerns in his sculptures, as he lived by Frank Stella’s words “what you see is what you see”. It is perhaps this purity of intent, or maybe the sheer expanse of overwhelming color, that grant his works an unexplainable emotive power that resonates within. This exhibition of more than fifty works by the artist brings together some of his earliest works as well as his most recent explorations of form and space. “The Alchemist of Line” is curated by Nasreen Askari, Director of the Mohatta Palace Museum, and Durriya Kazi, the Head of the Department of Visual Studies at the Karachi University, who not only take us on a journey through four decades of the artist’s illustrious career but manage to highlight new narratives through the curatorial decisions they have made. The exhibit is divided into five rooms, each leading into the next, guiding the audience across a thematic presentation that creates new points of interest in the artist’s oeuvre. The first two rooms titled “Perfect Imperfect” feature geometric works almost mathematical in their precision. Squares and grids spread across fields of rich hues, yet these repetitive structures unravel in places creating the illusion of wire mesh coming apart. There is a deliberation to this disruption in order which seems to help ground the works. As we move to the second room, these grids turn into large scale circular forms comprising a cacophony of lines and marks. Here the imperfections seem to be almost too deliberated, with their seamless, pristine introduction adding to the illusion of perfection rather than taking away from it. These works seem to encapsulate life itself, abstracting its essence into the endless circle, with the power of the line defining both its mundane routine and chaotic madness. “Kinetics” displays a sense of movement, both within each work and from one canvas to another. The print-like squiggles become increasingly dense as you walk past each work, turning to deafening confusion before fading to a dark expanse. 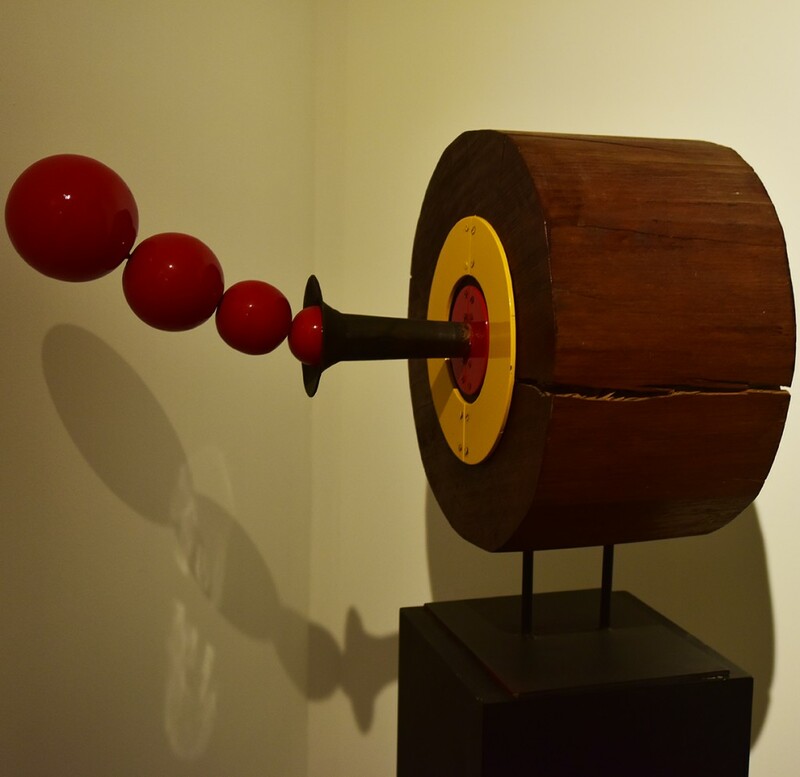 Other works seem to depict vibrating energy propelled forth by unseen forces. The large sculptural installation seems almost a whimsical portrayal of the birth of constellations. Moving on, the works take on a more nuanced approach, with both geometric and organic elements coming together to create nonrepresentational explorations with hints and illusions of reality. The use of color also displays a shift here, with certain pieces showing an intermingling of tones and shades to create depth and a sense of spatial relationships in contrast to the flat application seen previously. As a result, shapes and forms begin to resemble objects, spaces and scenarios. 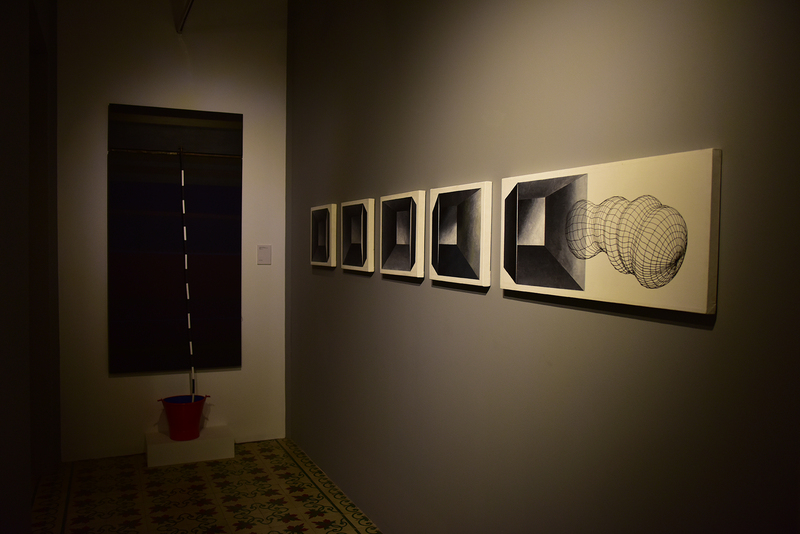 The works in the last room are accented by the recurring presence of the “X”. It is unclear what this might have represented for the artist himself, but what is interesting is that in each piece it seems to take on a different role dependent on its size, placement, and execution, proof of the power of composition. While in some works it appears to be a target, in others it elicits the phrase “X marks the spot”, representative of precious buried secrets. In others it merely seems to be imparting critical judgment on the other elements present in the works. While the curatorial format of the show certainly adds dimensions to the works, one can’t help but wonder whether these readings are a result of the guiding word of the curators, as the abstract nature of the works allow for multiple understandings. A line is but a line and may as easily represent a single atom as it could the entire cosmos, yet the artist’s own intentions remain as abstract as the works themselves. The aptness of the title becomes apparent as a simple study of color, shape, and line interacting with space is transformed into something so meaningful and speaks to so many on multiple levels, and therein lies the beauty of Imran Mir’s art. 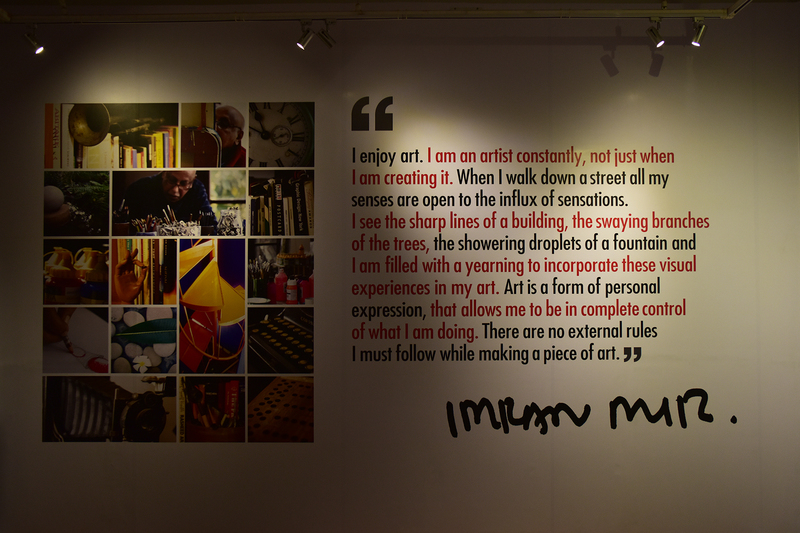 Thank you ArtNow for your comprehensive and articulate coverage of the parallel major art event in Karachi at the prestigious Mohatta Palace Museum, “Imran Mir – ALCHEMIST OF Line ” October 20th 2017 – October 20th 2018.